Freedom Rockz: Free Ice Cream Everyday! Get your Free Ice Cream everyday @ Dickey's! Kids eat Free on Sundays! 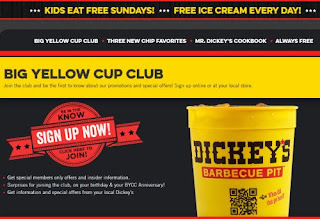 Just click blow to get the details & sign up for their Big Yellow Cup Club to get special promotions & surprises.